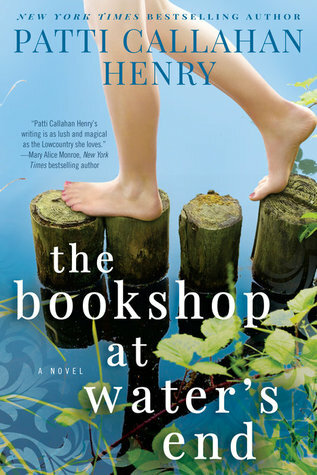 Summary (Provided by Goodreads): Bonny Blankenship's most treasured memories are of idyllic summers spent in Watersend, South Carolina, with her best friend, Lainey McKay. Amid the sand dunes and oak trees draped with Spanish moss, they swam and wished for happy-ever-afters, then escaped to the local bookshop to read and whisper in the glorious cool silence. Until the night that changed everything, the night that Lainey's mother disappeared. Now, in her early fifties, Bonny is desperate to clear her head after a tragic mistake threatens her career as an emergency room doctor, and her marriage crumbles around her. With her troubled teenage daughter, Piper, in tow, she goes back to the beloved river house, where she is soon joined by Lainey and her two young children. During lazy summer days and magical nights, they reunite with bookshop owner Mimi, who is tangled with the past and its mysteries. As the three women cling to a fragile peace, buried secrets and long ago loves return like the tide. If a book has “bookshop” in the title it immediately lands on my radar. This cover is the perfect summer cover and drew me in. This book made a solid first impression and I immediately would’ve picked it up off the shelf based on the cover alone. This book was so cute! It was the perfect summer beach read and exactly what I needed. Bonny and Lainey are lifelong friends who started as Summer Sisters at the age of eleven. Now in their fifties, Bonny is having a bit of a life crisis. Her marriage and job are falling apart, so Lainey suggests that she return to the summer home that they haven’t been to since they were 13. Bonny brings her 19 year old daughter Piper who is also having a bit of a life crisis. When Bonny, Lainey, and Piper head back to Watersend for the first time in 40+ years, their past catches up with them and they are all forced to face themselves. This book is told in alternating points of view between Bonny, Lainey, and Piper with an occasional perspective from Mimi the bookshop owner. While my favorite perspective was Piper’s, because she’s the closest to my age, but I still enjoyed Bonny and Lainey’s stories. Each character had their own issues that they had to confront and I liked that it was really about personal growth. There wasn’t a lot of silly issues that got in the way of bigger issues and I really appreciated that. What I enjoyed the most about this story was the writing. It drew me in and made me feel like I was at the river house and that I was a part of their vacation. I also found that the balance between the present and the past to be perfect. I never felt like I was stuck in the past stories and wanting to get back to what was currently happening, but at the same time I never felt like I was only getting the present storyline and was confused as to what the past had to do with anything. If you enjoy summertime stories about family and personal growth this will be the perfect read for you. I loved the balance of the storylines and how they were so different amongst themselves. I’d highly recommend this as a beach read and am looking forward to reading more by this author.